The Manna center had something of a rough week last week. Monday we inexplicably lost electricity in half of the library; Tuesday the water stopped working in our bathroom sinks; and Thursday we were informed that we would have to indefinitely vacate two of our three upstairs rooms because our landlord had a verbal agreement with the prior tenant that if and when she returned she could have those rooms again, and we had nothing in writing that guaranteed us those particular rooms. The landlord told us we had to be out by Friday afternoon. Of course, in order to properly and poetically close the week, Friday morning while our landlord was trying to turn back on the water, something burst and suddenly our library ceiling was leaking from the ceiling in multiple places. By a great stroke of luck, Luke and Brock stopped by the library after a morning meeting in Rumiloma and discovered the leaks, so they were able to move our computers and bookshelves to a dry part of the room before the water could damage anything. That afternoon we moved out of the rooms upstairs and closed the library for the day due to water leaks. 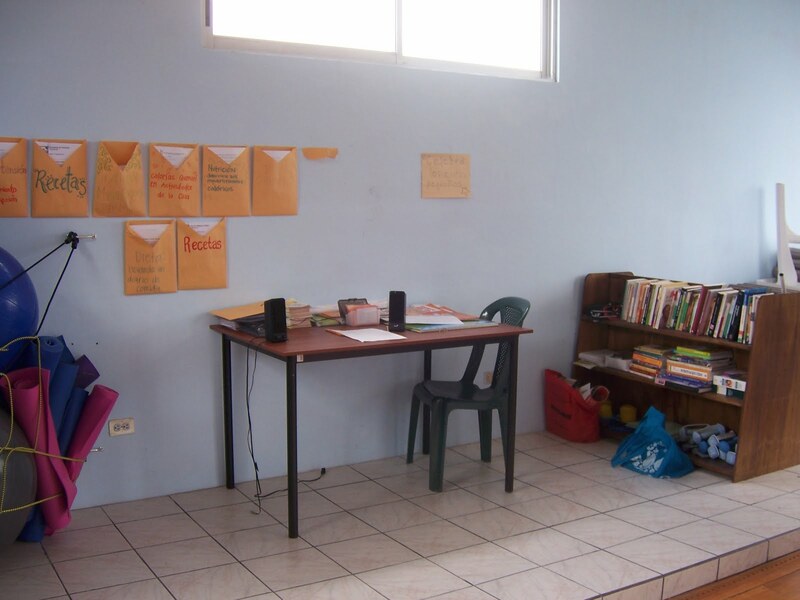 The rooms that we lost were our Preventive Health Center room and the English classroom; we still have our big room with the kitchen that we use for women’s exercise and cooking classes. Lots of scrambling happened over the weekend to change our class schedule (which starts this week!) to accommodate all classes taking place at the big table in the library downstairs and figure out what to do with the PHC. Hannah, Becky, and I, as program directors for the PHC, were particularly disheartened by the loss of our designated space. The PHC has been a difficult program to get off the ground, and to lose our room seemed like a cruel joke. However, Mondays bring fresh ideas! Upon considering a portion of the women’s exercise room as a temporary home for the PHC while we figure out what to do about new spaces, the PHC began coming to life in our minds in a way it hadn’t before since we arrived in July. What if we put the table and books on a bookshelf on the raised, tiled section right next to the door so that when people come to the exercise and cooking classes they will be aware of us and take an active interest in the PHC? We can create a real space here to pull together and integrate into our other already thriving health programs an overarching Preventive Health Center in the same room. With our morale boosted and our creative juices flowing, the three of us paid a visit to the Ministry of Health in Quito on Wednesday to request information and possibly materials on preventive health concerns in Ecuador. The folks at the MoH didn’t hesitate to answer our vague requests by giving us a mountain of posters, brochures, and other health literature for us to take home and properly outfit our new space with. They then proceeded to laugh good-naturedly at our awestruck and overly grateful reactions to such unexpected generosity. So, despite what seemed like a thunderstorm of ill fortune last week, we on the Preventive Health Center team are excited for new prospects afforded by unexpected calamity. Needless to say, we’re going to be getting a contract for that room in writing. Movin´ on down... into the Valley! Manna Manna, How Does Your Garden Grow?